The Crohn's and Colitis Foundation of America has added a new Community section to their website. A rep from the CCFA contacted me through this blog to tell me about it. Obviously in hopes that I would mention it. Well, I do get contacted once in a while about things like this, but I refuse to mention something on this blog unless I've reviewed it myself and think it's valuable and free of "agenda". In this case it's coming from the official CCF foundation, so I took a look and it does have some useful features such as a forum and personal stories of people with IBD. The information resources aren't much more expansive than what you'd usually find online but it's well organized and from an authoritative source. You'll find the website here: http://www.ccfacommunity.org. Sadly, I find that at least with the CCFC here in Canada, they are very focused on research and not so much on support. So anything that adds a support element to these foundations on either side of the border is great in my book. On Wednesday, October 6 at 1 pm EST the Crohn's & Colitis Foundation of America will host an educational program on emerging advances in Crohn's disease treatments for patients, family members and caregivers living with Crohn's disease, a chronic and often debilitating digestive disease affecting over 700,000 Americans. This interactive webcast/ teleconference, Progress in CD: An Update On the Advances In Crohn's Disease, which is supported by an educational grant from Centocor Ortho Biotech Inc, is now open for registration at www.ccfa.org/webcasts/CrohnsUpdate. The program will be led by Dr. Jonathan Braun, M.D., Ph.D., Professor of Pathology and Laboratory Medicine, and Molecular and Medical Pharmacology, at the David Geffen School of Medicine at UCLA. He will discuss the emerging advances and progress in treating and understanding Crohn's disease and answer audience questions during an interactive question-and-answer session. "New discoveries and therapies for Crohn's disease are emerging and through the Crohn's disease update event on October 6, patients nationwide can tune in and hear more about recent discoveries and the latest treatments," explains Dr. Braun. "I highly encourage all Crohn's patients and their caregivers nationwide to take advantage of this opportunity and tune in to the event." • What are the current and emerging therapies for Crohn's disease? • How is research targeting and utilizing genetics? • What is new in pediatric research? Many of us who have had to make 'generous' use of the medical system - in any country - have found that sometimes we have to be our own medical managers - keeping everything organized, following up with doctors who don't get back to you, asking about treatment options or insisting on tests. Like any field, the medical community has it's shinning stars, and it's... well... other guys. Here are some suggestions and strategies for advocating on your own behalf and being pro-active with your medical care. In a notebook, write down a list of questions for your doctor in advance of appointments. Bring this with you and actually refer to it during the appointment. Do not let yourself be rushed out before all your questions have been answered. I have found that once I get in there my mind goes almost blank- so this list is a life saver! As soon as you leave the appointment (maybe in the waiting room or your car), jot down notes about what the doctor told you. Here's where bringing a notebook is doubly useful. If you wait too long, complicated instructions and opinions can be forgotten. Research the tests or treatments that your doctor is recommending. Call your doctor or the lab where you are heading if you think of questions prior to a test or treatment appointment. Ask your doctor about treatment options that he has not mentioned or suggested. Ask him or her whether they are a good fit for you. Always ask about possible side effects and costs related to new treatments or tests you are being prescribed. A pharmacist is an excellent resource for all kinds of drug information. If your doctor or pharmacist is not familiar with something you mention, ask him or her to look into it and phone you back at a later date. Always ask for the results of your tests. Even if it's a "if we don't call you, everything is fine" type of situation. If you do not feel that your doctor is doing everything possible to help you or if you do not feel like you can trust your doctor, it is time for a second opinion or new doctor. Ask your primary doctor to refer you to a different specialist. Be prepared to travel to find the best doctors and medical facilities. It is cost effective to localize expensive equipment and facilities in large cities. Discuss with your employer the possibility of being able to move your work schedule a bit to accommodate appointments that often fall into the difficult M-F, 9-5 time of day. Ask if your doctor has office hours on the weekend. If there is something you do not understand, ask for clarification. Most doctors do not talk "over our heads" on purpose. These terms are commonplace to them, and they may need a reminder that you don't know what the "normal range" is for that number they just gave you. Do you have more tips on this subject? Let me know! Bought A House! Stress Explosion! As if getting engaged isn't exciting enough, my darling man and I are also in the middle of buying a house. This is the first house purchase for both of us, and let me tell you- I am sick of apartment living! The house is in the town where I grew up, the 'commuter town' outside of the 'big' city. In the last week it has been a whirlwind of open houses, then making an offer on the one we fell in love with, waiting for our offer to be accepted (agony! ), getting mortgage approvals (credit unions are awesome), getting home insurance, etc. Yesterday was the home inspection and the inspector checked it out top to bottom including the in-ground pool (oh yeah) and it's a gem! We are signing the final documents tonight and contacting the lawyer to finalize it all this week. We will be able to move in on the 31st of this month. So soon! On top of all that has been wedding planning which is slowly gathering steam. I have been a stressball which is wrecking havoc on my poor Crohnsy guts. I am acutely aware that I feel my emotions physically - my stomach has been alternately in knots and full of butterflies. Sometimes 5 or more trips to the washroom. It's crazy. I really do need to calm down, and not let the excitement allow me to lose focus on my health. I am appreciating being in remission, but that doesn't make me totally symptom or risk free. It's the best time of my life these last couple months, I need to enjoy it, and take care of myself at the same time. New News - A New Design And A Cruise! Blogger recently introduced new template designer tools which are just fantastic. Hence the new design! I hope it's sufficiently cheery. I'm feeling cheery because in a few days I'm leaving on a week long Caribbean cruise. There are three couples going- we've all been friends for years and years (plus my boyfriend of 2 and a half years). This is especially exciting for me because since my surgery I have been able to eat almost anything. Prior to surgery the prospect of a cruise was a scary "what am I going to eat!?!" proposition. Now, I'm completely excited knowing that I will not be burdened with extreme diet restrictions. I am also aware that Crohn's free vacations may be few and far between for me. Who knows how I'll be feeling in the years to come? That said, I am determined to make the most of this trip no matter what. We have snorkeling, para-sailing and a jet-boat ride all booked. Fun in the sun (or rain) here I come! Many readers might be in a different boat right now. If you are feeling bad and struggling with your IBD symptoms - don't be discouraged! Whether it's a big trip, or even just dinner or a movie with loved ones, we can always remember to appreciate the positive opportunities that come our way. No matter how tough it seems, there is always a little (tame if necessary) fun to be had. It also helps to remember that there may be a treatment out there that will work for you. Never give up! Last Wednesday I did something that took me years to work up the courage to do. I went to the Canadian Blood Services clinic to donate blood. I figured that after a PICC Line and an NG Tube, I could handle this no problem. After filling out the paper work and getting my finger pricked to test my iron levels I was denied based on having slightly low iron. However, the nurse still brings you into a private interview room to explain how to get your iron levels up. During that conversation I discovered that if you are on iron supplements due to your doctor's orders, they won't take your blood because they don't want to counteract what your doctor is doing (building up your blood levels). Then when I mentioned that the iron supplements were related to my Crohn's disease, she then looked up Crohn's in her binder and discovered that people with Crohn's are 'indefinitely" barred from donating because it would be a danger to the individual. If you had a flare-up or intestinal bleeding, they don't want you to be weakened by giving blood. Too dangerous. So, there you have it. Got Crohn's? No donating blood for you - at least not in Canada. It has now been about four months since my surgery. For new readers- I had about 30 cm of badly damaged terminal ileum removed back in February. A week later I had an obstruction and was back in the hospital but it resolved itself. All in all I had about 3 weeks of hospital time and 5 weeks total off work. So, inquiring minds want to know... how am I doing now? Fan-frickin-tastic that's how! I am totally off of all Crohn's related medications, pain free, and nearly diarrhea free. The best part is... (drum roll)... I can eat almost anything I want! It's like being freed from 7 years of prison. I went through about 2 months of eating all the junky crap I thought I was missing. I'm now over that phase, and discovering all the healthy stuff like fruit, juice, fresh veggies, whole grains, cheese, salad, yogurt, etc. It's awesome!! I find that un-healthy foods leave me feeling kind of sick and blah. My boyfriend and I are working on eating healthier and getting more exercise. I find that I now have more energy; whether it's because of my healthier eating habits or the fact that intestinal inflammation is no longer sapping my energy, I don't know. Maybe both. We are having a competition each month to see who can go up the 8 flights of stairs to our apartment the most times. Nothing like a little healthy competition! Over all I feel like I have a whole new me. A new lease on life. Sadly, I realize that this likely won't last forever. IBD could return in a few months or a few years. I'm just hoping to make the most of this- and bank up as many cancer-fighting foods, and awesome experiences as possible in the meantime. Starting with a cruise this summer, and learning to roller-blade. I also hope that if and when it comes back, I can catch it earlier this time. Overall, my post surgical resection experience has been a fantastic one. Here's hoping it lasts as long as possible! If you have IBD then you have probably had to take, or been offered corticosteroids by your doctor. The most common one I've seen prescribed is Prednisone. Drugs like this are majorly effective at reducing inflammation. Unfortunately, while it is pummelling the inflammation, it's wreaking havoc across the rest of your body too. Several months ago when my doctor suggested that I go on Prednisone for the second time, I asked about another related drug called Entocort (generic name: Budesonide). I had heard that Entocort has fewer side effects versus Prednisone. My doctor was in favour of trying it. So I have the benefit of being able to compare them. Predisone comes in tablets while Entocort comes in a capsule which is more targeted to your small intestine. Unfortunately I can't compare their effectiveness because my flare ups were very different situations. But here at least is a list of the side-effects which I experienced. Both drugs were only taken for a couple of months then tapered off. * This one really worried me and was the main reason I did not want to take it again. Ultimately the main difference is that Entocort did not make my hair thin or my heart beat irregular. Also, Entocort required fewer pills to be taken, although the Entocort capsules did float which made them tricky to swallow. In the end, I much preferred Entocort. My doctor even told me that Entocort is known to cause fewer side effects. Each person is different and you might have a totally opposite experience, but I thought this might be helpful to someone. If you have taken either of these drugs, please share your feedback too! A few days ago I sent an email to 3 different people within the CCFC (Crohn's and Colitis Foundation of Canada) asking two questions about how donation dollars are spent and how it translates into actual results. Recently as I was making a donation, I wondered whether my donation dollars were funding research that might later lead to a treatment that would cost me a small fortune to access for myself. I also wondered whether promising but potentially non-profitable treatments were funded.... such as the Helminthic Therapy which I had previously mentioned on this blog. Pleasantly, I received a full reply to my questions only one day later from Dr. Tolomiczenko, the Executive Director of Research & Scientific Liaison for the CCFC. In a nutshell the response is about what I expected. Patents for treatments are held by whoever applies for them, regardless of who funded the research. I can only assume the CCFC does not apply for patents themselves, and why would they? The doctors and companies connected with the research are solely responsible for getting a treatment to market and bear those costs themselves and therefore can charge whatever they want for it. It would be impossible for the CCFC to go the next step of translating research results into actual treatment products, and this is not their mission, nor should it be. As for which research they fund, this is totally open as long as there is scientific merit to the research and it has a chance of advancing toward a cure for IBD. This is regardless of whether it would lead to a profitable treatment or not. They also focus on research that increases our understanding of IBD and it's causes- and that's a good thing. So, ultimately it's not the "I funded it, so I should get free access to it" answer that I dreamed of but didn't seriously expect. It's just not feasible. Bringing a treatment from research to actual product (or service) is a lengthy process involving many individuals and organizations. I myself guess that most doctors and scientists working on this research are doing so in the employ of a large company who actually owns the results and would determine it's cost to patients. Companies like this would be unlikely to pursue research that does not lead to a profitable product. I assume that this corresponds to the types of research proposals sent to the CCFC. I think this leads to the question: how do we get companies and scientists to pursue research that is promising but maybe not as profitable? Government grants? Social pressure/encouragement? I'm open to ideas. I think the CCFC is an important ally in our struggle to find a cure for our disease. I hope we continue to hear good news about advancements in our understanding of IBD and more treatment options - hopefully some that don't involve powerful drugs. If you are interested in reading my actual email to the CCFC and the reply email I received, they are included below. I am writing to you as a CCFC member, as someone who has Crohn's Disease, and as someone who makes additional donations to the CCFC. I have a couple of questions related to how the CCFC funds research projects and what happens to the results of this research. I'm very excited by the projects that the CCFC currently supports, such as the Gem Project, and I think that projects like these are donations well spent. Recently however I was investigating treatment options for my Crohn's Disease and discovered that some treatment medications cost close to $1,000 per infusion! This got me to thinking about the research that the CCFC funds. I have two main questions regarding this. 1) Who owns the patents for, or who determines how much any treatments or cures discovered by CCFC funded research will cost? I find it disconcerting to think that my donation dollars might help to discover a cure or treatment that may later cost me a small fortune to access for myself. Who gets to profit off of treatments discovered by CCFC funding? 2) Does the CCFC also fund research that may lead to viable but possibly non-profitable treatments or cures? Some research on Helminthic Therapy by Dr. Weinstock (His Paper: http://www.newtreatments.org/loadlocal.php?hid=949) comes to mind. This therapy seemed to be showing promising results, and then research for it seems to have disappeared. Is this because it would not be a profitable treatment? I want to stress that I am proud to be a CCFC supporter and am just curious to learn more about what happens with my donation dollars. Thank you for your time and for all the great work that the CCFC does on behalf of those of us with IBD. 1. Patents are held by the individuals or institutions that file them. CCFC is currently developing an intellectual property policy to give the foundation more of role than it's had in steering research in the direction of development into new treatments and products. This is almost entirely in the domain of companies that have the resources to move ideas from the "bench to the bedside". This typically costs quite a bit and can lead to expensive medications that cost much to make. To recoup their investments, industry charges what payers are willing to pay. The profit incentive is very powerful and serves to drive drug development and other innovations. 2. CCFC is open to funding any and all proposals of scientific merit that have a chance of advancing toward a cure. The helminth exposure work connects with a wide range of "toll-like receptor" and "cell signaling" research that is ongoing among a number of different scientists across Canada. We are working with our scientists to ensure that they translate their science into hope for cures in plainer English but that's certainly not an easy task. I hope this addresses your questions. I would be happy to talk with you at some point by phone if you would like. This would work best if you sent me a few times that would work for you and we could arrange an appointment. George Tolomiczenko, Ph.D., M.P.H., M.B.A. It is now one month since my surgery and I am starting from scratch in the fitness category. My eyes have been opened to how wonderful it is to feel good and how badly I want to re-invent my life and make fitness and active living a part of it. I thought I would share this part of my journey on my blog - since Crohn's Disease can wreak such havoc on our ability to be active, maintain a healthy weight, eat well, get rest and more. Also, watching Biggest Loser can be so motivational! So, here it is. - Gain at least 12 lbs to reach a healthy weight of at least 128 lbs. - Increase cardio and weight training exercise slowly. - Get better sleep. No more snooze button! - Eat a well rounded, healthy diet. I am truly starting from scratch. I can only do some stretches and a few very light exercises. The snooze button is my enemy. I have gone nuts on foods I haven't eaten in years - I need to ease up and introduce foods slowly. And thus begins a new adventure! Vomiting (possibly with nausea) - make note if there is blood in the vomit, this usually looks like dark coffee grinds. Change in pain - cramping pain or sharp pains that are new. Constipation or new diarrhea. If you are not passing any stool or gas call your doctor asap. Blood in your stools (looks almost black). Infection around the incision site: redness, pus, odour. This is not an exhaustive list- there may be more things but these are the ones I know about. Hope this is helpful. I'm feeling better and better lately, the incisions on my abdomen are healing up nicely. I still have swelling right around my belly button, but it takes a long time for swelling to go down. The main 'symptom' affecting me is fatigue. The slightest activity exhausts me. Going out to a friend's house leaves me utterly wiped out by the end of the evening. However my surgeon warned me of this so I'm trying to take it easy and not push myself too hard. The other thing going on is my ravenous appetite. It's like I've been freed from 5 years of food prison and am suddenly on a food-gone-wild binge. Fruit, Subway, tomato sauce, juice, freezies, yogurt, cookies, you name it. Though I'm not sure how well I'm tolerating these things, because I've had mr. D constantly since the surgery. I think I need to take it a bit easier and just introduce new foods one at a time. I also need to gain weight. I'm still way under what I should be. Ensure Plus is helping with this. All in all I can say that so far, I'm glad I had the surgery. Well, I haven't actually been home for the last week. A day after my last post, having only had a day and a half of relaxation at home, I woke up in the middle of the night and promptly vomited into my garbage can next to my bed. This led to me moaning to BF to "Get me a bucket! And some garbage bags! And a wash cloth! *Groan!*". A wonderful beginning to 48 hours of throwing up, nausea, weakness and unable to keep anything down. I would sip water for a few hours then throw it up. Repeat. Spent hours lying on the bathroom floor. It's the flu I said to myself. After 2 nights and a day and a half of this, my home-care nurse arrived to change my bandage. She took one look and me and decided she couldn't leave me here in my apartment by myself. She called my surgeon to consult and then an ambulance was called and I was brought to the hospital. And admitted again. *sigh* I was there from Thursday till Monday. Turns out I had a bowel obstruction. The solution to this (before resorting to surgery) is a new kind of torture called a Nasogastric Tube (http://www.youtube.com/watch?v=en5ctZInOyA). Don't be fooled by the calm video. It took them 4 freaking tries to get it into me. The first 3 were rammed down my nose at hyper speed and came out my mouth, leaving me with a bloody nose and the shakes. They then gave me a rest, some 'numbing gas' to breathe then a doctor came and inserted it slowly and nicely. Better. An NG Tube is a torture device. You feel it constantly. Your body wants to gag on it, it's like a finger in the back of your throat as you talk, turn your head, breathe, swallow, etc. When you want to get up and go the washroom they unhook you from the pump that is emptying your stomach and you get to have a length of tube swaying from your nose. This made me walk like I was on eggshells trying to minimize the swaying of the tube. Luckily coming out it's much easier and a big relief. I also was 'NPO' which means nothing to eat or drink. Thirst is a powerful motivation. I found myself raving madly in my head about how much I wanted water. That ice is a product of heaven, and why wouldn't the cruel, cruel nurses let me have some ice. Ice is the opposite of hell because hell is fire and water is salvation. On and on raving for hours. It was odd. I would even sneak a straw into the bathroom to take tiny sips of cool water from the sink. It was strange... but kinda funny. If there's a bright side here, it is that after they pumped about 3 to 4 liters of junk out of me, it relieved the pressure on the blockage which resolved itself. Yay- no surgery required, so the NG torture Tube was worth it. After a few more xrays (am I glowing yet? ), some medications and the tube taken out I was sent home yesterday, now able to keep food down again. I'm taking it easy though, soft light meals, lots of liquids and soups. I also retained water while I was there so my feet, legs and abdomen are a bit swollen. I'm elevating my feet constantly and they are slowly getting better. Eight days after my surgery I am finally home from the hospital. I was there for about 18 days total. According to my surgeon it was a big success. No surprises, everything in the right place, 30cm of damaged small intestine removed along with the end of my colon and my appendix, as well as the fistula abscess area badness and even my previous scar was removed and re-stitched so it heals nicer this time. She was able to do it all laparoscopically so I have two small one cm long incisions, a 2 cm incision where my old scar/fistula was, and a 5-6 cm "C" shaped incision around my belly button where most of the work was performed. Each one is closed with disolvable stitches. The middle one around my belly button is the only one that still needs a bandage, it's very puffy and swollen and still draining a bit of blood. This is where the work was performed- apparently they can stretch a small incision like this quite wide as they work, but it is now very sore. She said she went along my entire small intestine and found no other signs of the disease. yay! Prior to the operation I was on a TPN IV to gain weight and strength for about a week and a couple days. At the start of the operation, they gave me an epidural. I was a basket case of fear! Would the epidural hurt? Would I wake up with a massive incision? Complications? The epidural was not as bad going in as I expected. I had to sit on the table/bed in the OR and hunch my back and put my head down. A nurse was holding me in place with a big bear hug to keep me from straightening up. She had quite a comforting bosom for hugging lol. I tried to study her name tag to not focus on what was going on with my exposed spine. He sanitized the area, gave some small shots of freezing, then I just felt pressure as the epidural was put in. *shudder* It is a very long metal flexible wire. Then they taped it all the way up my back. I then laid down, and they starting giving me the 'good stuff'. My last thoughts were of my family and friends then out like a light. I next woke up in the OR groggy and totally numb and was told that it was a success. My entire abdomen felt like someone else's body- utterly numb. I was confused and thirsty. I kept gasping for air. After about an hour and 45 minutes in the recovery room I was wheeled back to my room, my parents and boyfriend meeting me in the elevator. I don't remember much of the next few hours except asking repeatedly where my boyfriend was despite him being right beside me. I started coming around more in the evening and remember discovering the catheter that was now my new friend for the next few days (ug) and the oxygen tube in my nose, IV bags going into my PICC line (a more permanent type of IV line), epidural line coming out my back, and slowly creeping presence of pain. Whew I was a mess. For the rest of that day and the next I was allowed nothing at all to eat or drink. Only a sponge on a stick that I could wet and wipe on my lips and tongue. I cheated and took little sips out of the sponge, but god I was sooooo thirsty. I remember my Mom preventing me from taking too much. By far the most poignant memory is the first night after surgery. My epidural line turned out to not be in quite the right place. As a result it was numbing my left side and chest, but barely at all for my actual painful areas. You cannot have much in the way of extra pain meds when on an epidural without permission from the anesthesiologist, who had gone home by then. By 1am I was in agony. By 3 am I had passed my previous 10 out of 10 pain level by a mile and reached new levels of pain. I was nearly hyperventilating and gasping for breath. I couldn't even breathe enough to cry. My poor nurses were beside themselves. They gave me a low shot of Dilaudid which brought my 10+ pain down to a 9.5+ for only half an hour but was only allowed it every 2 hours. The poor nurses were not allowed to give me anything else, but there was no anesthesiologist on call who could authorize it. As a result, I went though an entire night of true torture. By the morning, if someone had said- give me all your money and secrets and I'll take away your pain.... I would not have hesitated. *shudder*. By 8 am or so my surgeon came in and took one look at my gasping, pale face and said "This girl has no pain control!" (clinically put but a sorry understatement) and swept out of the room. She tracked down an anesthesiologist in short order who swept in with a shot of something heavenly into my epidural line and then rolled me onto my side (groan) and adjusted the epidural by pulling it out a few inches, lowering the position of the numbing effect. A few hours later and a shot of morphine on top of it all and I was finally able to put coherent thoughts together and then fall asleep a bit. Fortunately for other people this 'incident' with the badly placed epidural is not common... I don't want to freak out other people before their own surgeries. But whew, worst night of my whole entire life. Times 100. For the next week I was slowly introduced to a liquid diet, and dealing with considerable but non torturous levels of pain, and helped to hobble to the washroom lugging my IV pole with me. Eventually the catheter was removed and the epidural line. After a day or two I didn't need the oxygen line anymore, and they unhooked my IV nutrition line after about 4 days. I was brought onto solid food but could only pick at it, and drink down Ensure drinks. Food seemed a battle, I was 'full' after a few bites, and crampy and nauseous. But I made myself eat what I could. The last 2 days I was taken off morphine shots and reduced to 2 percocets every 4 hours. Yesterday I was discharged and I already feel the difference. I'm more rested, down to IBUProphen every 8 hours and 1 perc as needed. Eating is much easier now, I'm sticking to easy things like soups and Mac&Cheese (ate that for the first time in years! Woot! ), and going to the washroom is much less arduous. Very gassy and lots of big D, but I feel things improving each day. I can now walk across the apartment with only a bit of a hunch and hobble, and can sit upright for long periods. woot! Well I finally had an appointment with Dr. Surgeon today and she took one look at me and declared that I don't look good. She wants to do my surgery sooner (yay) but I need to gain weight (despite eating as much as I can I keep losing - 12 lbs under right now) so she is admitting me to the hospital tomorrow (yikes!) and putting me on TPN which is IV nutrition and when I'm a bit stronger she will do the surgery, hopefully in a week or so! So - a shockingly sudden turn of events, but I am praying that afterwards I will be better than ever. So, here it goes- I will let you know if it's Bright on the other Side of this ordeal! This will crack you up... at my last appointment with Dr. GI, I found out from his assistant/receptionist that he thinks surgery would be good for me! This from the doctor who sternly recommended Remicade and told me I should save surgery for a last resort! Does he realize what peace of mind he would have given me if he had told me this to my face?! Even if he didn't want to sway my decision he could have said it after I told him I had made my choice. Arg. Knife! Now! Or should I say... scalpel, now! Anyone else have their own alternative interpretations? PS - What do you think of the new blog design? Since I'm putting a lot into this blog, I figured I'd branch out from the default templates. That butterfly needs to be replaced though.... hm. When I write this blog I try to always stay positive, strong, and focused on my blessings. This is usually a fairly natural thing to do because it's who I am. However, even the most positive people can lose sight of those things when situations are hard and emotions go askew. The last few days have been incredibly hard for me. The wound in my abdomen (a fistula from my ileum) was starting to feel better and heal slowly, but then the pain came back strongly, the nastiness draining out of the wound increased, and signs of infection are appearing. Not to mention how hard this is on your body and how tired it makes you. The nurses at the clinic I've been going to every other day were concerned enough that they switched me to in-home visits and faxed details of the situation to my doctor. This is horrifying. Gross and embarrassing. Needless to say that my emotions went sideways too, complete with tears, despair, and questioning my boyfriend's ok-ness with all this. It's incredibly hard to feel like someone could still love you and think you're beautiful when you have the bandage equivalent of a mini diaper on your abdomen and walking is a chore. With surgery still 2 months away I felt like making it that long was an impossible ordeal. But a few things happened that brought the sun back out. The main thing being the right mix of loving encouragement and snap-out-of-it pep talks from BF. The man is amazing. He never wavers; even facing a teary eyed, exhausted, yucky-bandaged girl in jogging pants. He'll say I'm beautiful even when I'm hobbling around in PJs, hair askew from just being washed in the sink and bent over cradling my abdomen. *sniff* The support of loved ones is priceless. So things are rough, but I am working hard not to let myself stay down. A little bit of sadness and tears is healthy and normal, but it's vital not to let it overwhelm you. Get it out and then move on. Always remember that whatever suffering you're dealing with, it's just one thing in your life, it is not your whole life. There is always a bright side, sometimes you just have to search for it. I met with the surgeon today to ask my last round of questions. I had already made up my mind, but she talked me through the whole thing start to finish. She's going to start off doing it laparoscopically first, and only open the whole abdomen if it becomes necessary. That's good! The whole process takes about 4 hours, and I will be in hospital for 4-7 days as they monitor the gradual reintroduction of liquids then food. The day before I'll have to be on clear fluids and some 'prep' called PicoSala to clean me out. She also tells me that one of our goals and a likely outcome is that I'll be able to eat normally again! Woot! We also discussed risks. There's a 5-7% chance of the attached ends leaking their contents into my abdomen through the sutures. In that case I'll need another surgery and possibly a temporary external pouch as it heals. Terrifying to me but very low probability. Other possible complications are internal bleeding, infection and scar tissue. She said everyone who has surgery deals with scar tissue. But it's only an issue for me if it causes an obstruction. Either way, these complications will be dealt with if they come up. Afterwards I'm looking at a couple of weeks of fatigue as I recover... and pain of course. She said that when I go to the pre-op clinic a week before, the anaesthesiologist will discuss with me the option of having an epidural to control pain immediately afterwards. Not sure whether that sounds like a good idea or not. We'll see. But after recovery I'm hoping to be a new me. Or rather... the old me of 10 years ago. That would be awesome! The surgery is at the end of March so I have two months to gain weight, exercise my heart, and prepare. I'm scared and anxious, but also hopeful and impatient to be rid of this aching stabbing pain that won't go away. Surgery here I come, wish me luck! 2. Thoroughly cream together wet ingredients in a big bowl. 3. Blend dry ingredients into wet a bit at a time with a spoon or fork. Switch to using your hands as it gets thicker. Knead well. 4. Roll into 1 inch balls in your hand. 5. Place on a very lightly greased baking sheet with 1 inch space around each one. You can fit about 12 on a standard sheet. 6. Press each ball down half way with a fork. 7. Bake at 375 degrees for 10-12 minutes. Watch for the edges to get a bit brown. 8. 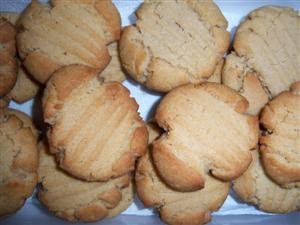 Remove from baking sheet immediately and place on a cooling rack. They will feel a bit flimsy when they are still hot. 9. Allow to cool for 10-15 minutes then store in an air-tight container. These are a great comfort food. I like to eat them with my favourite milk-replacement beverage, like rice milk. They might be good with chocolate chips, but I've never tried it. UPDATE: Jan 14: Got out of the hospital in the nick of time. The chat is still on! There is a bit of a warning about this scheduled chat. Since I am in the midst of a big flare up, the chat is dependent on me not being in the hospital and feeling well enough to set it up and host it. So if you visit that page at the scheduled time and don't find a chat window there, you'll know why and I will reschedule. *knocks on wood* Hope to see you there! Well, the ticking bomb in my abdomen has decided to go off again. Over the Christmas holidays I started feeling the return of pain in my abdomen. I shrugged it off as just holiday stress and food. And more food. By boxing day however it was dramatic and the day after I went to the hospital. To make a long story short I've been back 2 more times since then, and after an abdominal Xray, CT scan, and ultrasound it was pronounced that I have a trivial sounding 'micro' abscess. Micro?!? As the picture here will show, I think 'micro' is some kind of sick joke. I figured since so many of my fellow bloggers like to share various pictures (often disturbing) I would try for my own disturbing Crohn's picture of the week award. As the picture shows, my new abscess is right behind the scar from the surgery to treat my previous one. 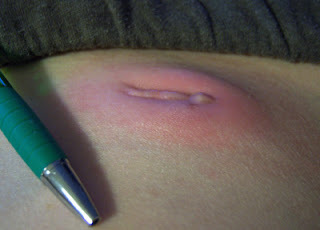 The scar which is normally recessed a few millimetres into my skin, is now puffed out and sitting on top of a red little hill about an inch and a half long (the pen in the photo is for scale). I was given two antibiotics and beefy pain killers. According to the hospital and my G.I. the antibiotics will solve the abscess problem. Really? It seems absurd. As for the painful flare up of inflammation in my ileum my G.I. and I discussed options. Humira and Remicaid came up but I was leary. Nothing will repair the damage already done, but we need to get this inflammation under control. Then, the dreaded P word came up. That's right- Prednisone! I vehemently said that I would not take it again. Not after the fluttering heart beats, fear that I would fall asleep and have a heart attack, hair falling out, and many more side effects. He then suggested Entocort. It is also a corticosteroid but in a capsule form which targets the intestine rather than blanket your entire body with it. He said it generally has much fewer side effects. It's generic name is Budesonide. I know what you're thinking - why didn't he give me that the first time around? Why prescribe Prednisone at all anymore? Who knows. So... I reluctantly agreed. I've also been referred to a surgeon, the woman who did my surgery a year and a half ago. I'll ask her whether the lump will actually be taken care of just by drugs. However, we will likely be discussing surgical treatment options for the root problem. I must admit, the thought of removing this 'dead' piece of ileum (10cm my doctor tells me) is attractive at this point. Extreme pain, a very restricted diet, these episodes.... a resection is seeming more and more tempting. I just want to live normally for a change. It's a scary option though. So, in the meantime, I'm taking a bucket load of drugs each day, suffering alarming pains and strange sensations, and waiting for the surgeon's office to call me. Alarmed is the word.